Energy-efficient thermally protected direct-drive motors. Additionally, multiple fan motors are staged to maintain the desired condenser supply fluid temperature. All motors are factory wired with leads terminating in a weather protected junction box located on the outside of the unit casing. Fan motors are ___ horsepower, 1075 RPM. Unit cabinets are constructed of heavy duty gauge aluminum, thoroughly reinforced with riveted gussets. The interior panels are insulated for sound attenuation. Air intake is horizontal. Standard discharge is horizontal with top air discharge available as an option. 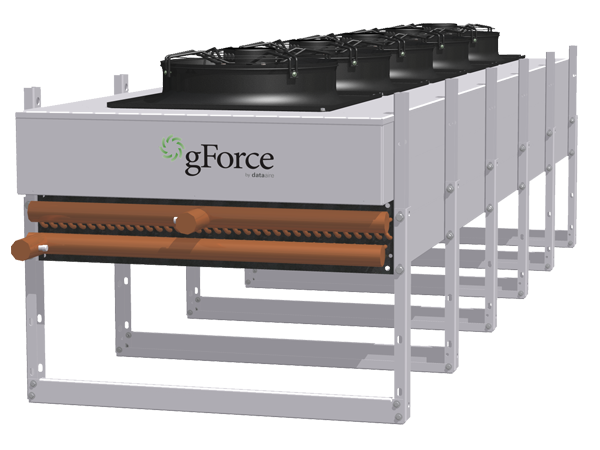 An optional integral filter rack with 4″ thick, 30% efficient filters (based on ASHRAE Std. 52.1-92) is available for the air intake. Each dry cooler is manufactured with a aluminum housing for longer life and protection from outdoor elements. Other features include an aluminum finned copper tube coil, powder coated fan guards, surge tank, motor contactor, pump contactor, and energy efficient thermally protected direct drive motors. Electronically commutated (EC) motors available.